Manitoba’s cattle sector has received substantial recognition for environmental stewardship this month. Sustainability awards were presented by the province of Manitoba to both Association of Manitoba Community Pastures (AMCP) and Manitoba Beef Producers (MBP). The AMCP received a 2017 Manitoba Excellence Award for Sustainability in Water and Natural Area Stewardship while an honourable mention in the same category went to Manitoba Beef Producers. Minister of Sustainable Development Rochelle Squires presented the awards May 22 as part of the province’s yearly recognition of organizations’ and individuals’ efforts to make substantive advancements in sustainability. Rachel Whidden, range technician for AMCP said everyone was very pleased about the award. “2017 was the first year of fully operating all 20 AMCP community pastures,” she said. Over 40 AMCP staff are actively and continuously maintaining 350,000 acres of the community pastures. Earlier this spring, the AMCP released a major study quantifying the significant ecosystem services derived from land management practices that enhance water filtration and retention, sequester carbon, conserve soil and protect wetlands and wildlife habitat. The AMCP’s work has a long history in the province, dating back to work undertaken in the 1930s to rehabilitate marginal lands and make them productive for cattle again. “AMCP is entrusted with managing Manitoba’s largest remaining prairie ecosystems and key species-at-risk habitat,” said Whidden. MBP’s award is in recognition of its efforts to optimize grassland habitat for bird life habitat. In March 2017 MBP began a three-year project in a partnership with Environment and Climate Change Canada’s Species at Risk Partnerships on Agricultural Lands (SARPAL) program. The program offers cost-shared funding to promote grassland management practices that protect the habitat of threatened grassland birds such as the Sprague’s pipit, ferruginous hawk, chestnut-collared longspur, loggerhead shrike, burrowing owl and the Baird’s sparrow. In its first year the project has had impact on nearly 10,000 acres in southwestern Manitoba. It is essential to the survival of these birds that these grasslands be protected, said Tim Poole, Manitoba important bird areas co-ordinator with Nature Manitoba. “The birds need the cattle,” he said. MBP president Ben Fox said beef production can be a part of the solution addressing society’s environmental concerns and cattle have an important role to play in protecting and maintaining a threatened natural ecosystem. “Helping protect healthy grasslands and water supplies is beneficial not only for beef production, but for the overall environment,” Fox said. Tim Sopuck, chief executive officer of the Manitoba Habitat Heritage Corporation, which nominated MBP for the award, noted that pastures and hay lands managed for cattle represent the single largest source of natural habitat in Manitoba’s agricultural region. 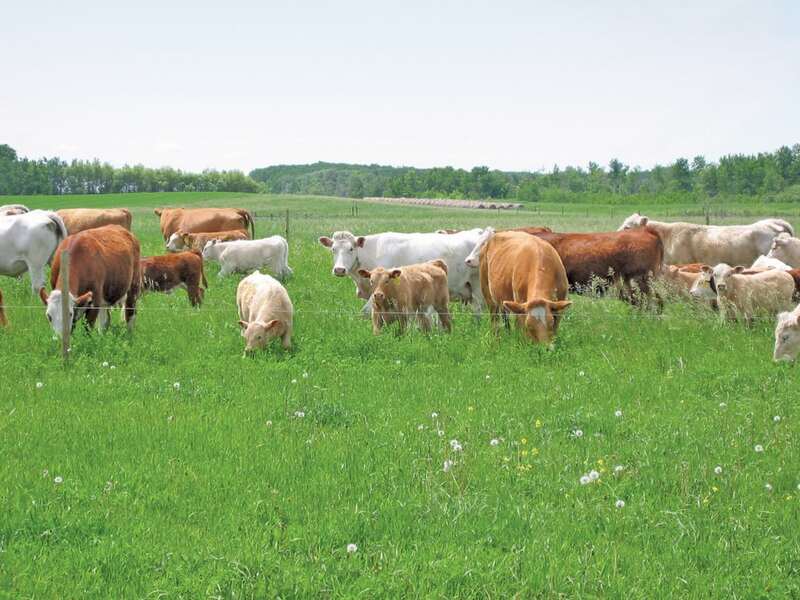 “Seeing both organizations recognized shows just how important beef producers are to conservation and enhancement of natural habitats and the environment in Manitoba,” he said.